Author, S.E. Hinton forever changed the direction of literature written for young adults when she penned her premier novel, the Outsiders. Remarkably, Hinton was just 17 years old when the book was published, the Outsiders, she has stated, was written as her response to the fluffy and feminine high school dramas about dating and proms and typical teen life in the 60’s. In an article written for the New York Time’s Book Review, she was quoted as saying, “Where is reality?”, proclaiming that she did not find the books of the time indicative of actual teenage life at all. She struggled to find books that spoke to the needs and lifestyles of others her age, she stated that the other books written for young people lacked the actual setting of “the drive-in social jungle…the behind the scenes politicking that goes on in big schools, the cruel social system,” or any of the teens who lived that life. Her book, on the other hand, was raw, gritty, emotional, real and every bit symbolic of life as a teenager growing up in the twentieth century in America. It was also exciting and capable of capturing the attention of teenage readers. 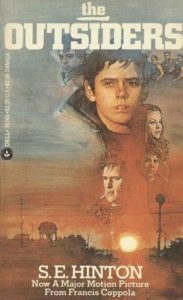 More than three decade after it’s initial publication, The Outsiders remains intensely popular and has sold nearly five million copies across the USA. It’s an adaptation to a features film, staring some of Hollywood’s most famous actors, was always wildly successful. The story follows a distressing time in the life of Ponyboy Curtis, a recently orphaned fourteen year old. Ponyboy lives on the East Side and is a member of a gang of hoodlums know as ‘greasers.’ Ponyboy has regular conflicts with his older brother, Danny, who is also his legal guardian and working to keep the family together. The greasers, who are separate from ‘hoods’ are poised to become the heroes of the saga. Pitted against them are the Socs (the upper-class kids) who pass the time by drinking, driving expensive cars and beating up the greasers. As the story progresses, three teens die. The book explores the themes of social class conflict, affection, brotherly love and coming of age in a way that is directed towards young people.